What’s better than a bread bowl? A coconut bowl. This Coconut Curry Chicken recipe is being served in the interior of a coconut. It is super delicious and it is lots of fun eating it! Coconut Curry is a taste that I don’t eat often enough, but when I do, my buds for taste go insane (in a positive way!). The Coconut Curry is easy to create and delivers a powerful punch of savory flavors. Although chicken is the ingredient that is main, you can add more veggies if you like. You can add peppers or sweet potatoes. Begin by putting the chicken in a skillet to cook—and put the other ingredients in other skillet. Once the chicken is cooked, add it to the other skillet and simmer for a few minutes. And voila—dinner is served! After the garlic and onion are diced and the chicken is chopped, you will need not more than 5 minutes to prepare the meal. It’s a simple recipe and makes for a no-hassle weeknight dinner (or quick lunch). Tip: In case you like a thicker sauce, add coconut flour (one to two tablespoons). Let the chicken and sauce simmer for about 10 minutes. Then let the sauce thicken by itself. I enjoy the added coconut flour, because it gives thickness. After watching one video on You Tube I have learned the technique of opening the coconut that we want to fill inside with a screwdriver and a hammer. And it worked! However, you have to be very careful if you use these tools. Of course, this part is optional, but it’s a gorgeous way to serve your meal while enhancing the coconut flavor. Not only is this recipe extremely easy to prepare, it’s equally good for your body. Coconut contains medium chain fatty acids, which are considered to be the good fats, you know, the ones we want to add to our diets. These fats a.k.a saturated fats have been found to help people lose weight by giving your metabolism a nice, big boost. In fact, a diet high in saturated fats, but also low in carbs, is more effective in helping you shed the pounds than a low-fat diet. 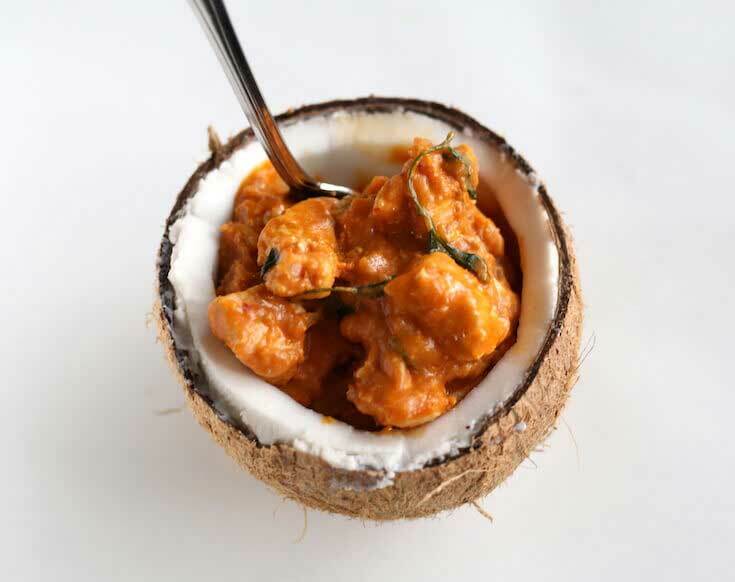 Enjoy this delicious 20-minute Coconut Curry Chicken recipe inside of a coconut! Cut up chicken into bite-size pieces. Heat oil in a skillet, add chicken, and cook until done. While the chicken is cooking, mince the garlic and dice the onion. Place in other skillet with curry paste, coconut milk, fish sauce, ginger, sugar and turmeric. Bring to a boil, then lower heat to a simmer. Once chicken is cooked, transfer it to the skillet with the sauce. Then simmer it for about 10 minutes. It is enough time for the flavor to be absorbed. Stir in cilantro. In case you like a thicker sauce, stir in coconut flour (1-2 tablespoons). Serve inside a coconut and enjoy!